Waikiki and Diamond Head. Rainbows, rain forests and waterfalls. Volcanoes. Coffee. Romance. The list goes on and on when people share their impressions of Hawaii. When the discussion turns to scuba diving some knowledgeable divers are quick to speak about Hawaii’s diverse shark population. 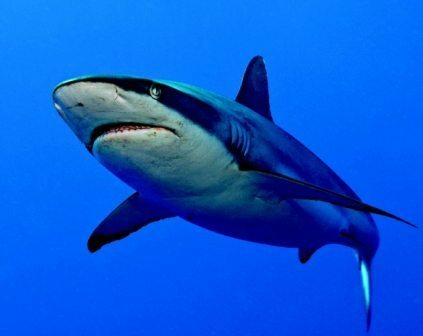 Those statements surprise other divers, which speaks to the fact that while a number of sharks are known to inhabit Hawaiian waters, in many places sightings are almost unheard of. 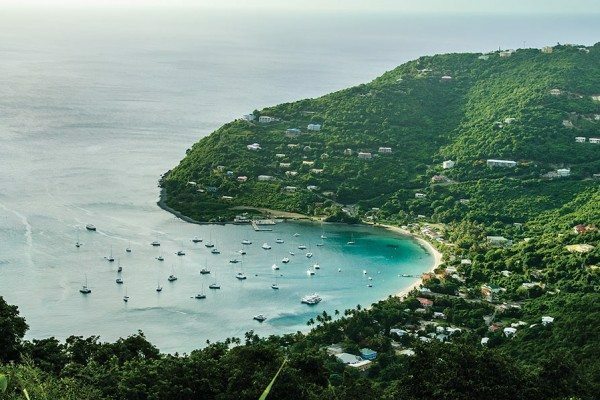 However, in other locales the sharks are the feature attraction. The whitetip reef shark is probably the most commonly encountered shark in Hawaii’s reef communities.As the common name implies, whitetips can be identified by the prominent white markings on the upper tips of their first dorsal fin and tail fin. 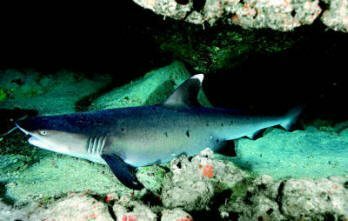 The whitetip reef shark (Triaenodon obesus) is probably the most commonly encountered shark in Hawaii’s reef communities. As the common name implies whitetips can be identified by the prominent white markings on the upper tips of their first dorsal fin and tail fin. These sharks are further characterized by their comparatively slender, supple, grayish bodies. Some specimens display a number of dark spots on their sides. Most adults are about 5 feet (1.6 m) long. The slight build and generally docile demeanor causes some divers to think of whitetips as “pussycats” in the world of sharks. However, when pursuing prey their sleek build enables whitetips to get into the tight confines of reef communities, places where many larger, less flexible-bodied predators cannot go. Although they readily feed if given the opportunity during the day, whitetip reef sharks are generally thought to be nocturnal predators. Hunting individually or in groups, whitetip reef sharks explore holes, caves, cracks and crevices in search of prey. Stomach content analyses reveal that a variety of small fishes, crustaceans and octopi are among their favorite food items. During the day whitetip reef sharks are often seen swimming in leisurely fashion or resting on the seafloor in caves, under ledges and even out in the open. Unlike many sharks, whitetips have specialized muscles that enable them to draw in oxygen-rich water that is passed over their gills while they are at rest, meaning they do not have to swim to respire. 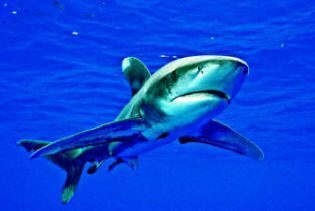 Oceanic whitetip sharks are large, muscular animals that make a lasting impression when observed in Hawaii’s legendary clear, blue water.A typical adult is 6-9 feet (1.8-2.8 m) long. As is the case with many sharks, the bodies of oceanic whitetips are dark gray on top with near-white undersides, a pattern known as counter shading. Tiger sharks are characterized by their heavy, robust body, blunt snout, broad head, and the vertical stripes and striations on their sides that resemble the stripes of terrestrial tigers. These body markings tend to fade with age. The tiger shark (Galeocerdo cuvier) played an important role in Hawaii long before scuba diving was ever invented. 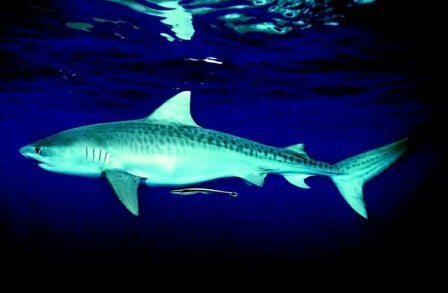 Some early Hawaiians believed that their deceased ancestors reappeared as tiger sharks, and as a result tiger sharks were revered. Being the largest of all the reef sharks observed in Hawaiian waters, adult tiger sharks typically reach lengths of 11-14 feet (3-4 m) and weigh as much as 1,400 pounds (630 kg). Tiger sharks are characterized by their heavy, robust body, blunt snout, broad head, and the vertical stripes and striations on their sides that resemble the stripes of terrestrial tigers. These body markings tend to fade with age. Primarily nocturnal predators, tiger sharks prey upon a variety of sources, including marlin and other larger bony fishes, marine mammals, sea turtles, other sharks, squids, octopi, rays and crustaceans. Surprising to some, tiger sharks have also been well documented to prey upon seabirds in shallow waters. In recent years several documentaries have shared dramatic footage of fledgling albatross chicks in the Northwest Hawaiian Islands being preyed upon by ravenous tiger sharks. When learning to fly, a sufficient number of the young birds manage to go only a few yards before dropping into the sea where opportunistic tiger sharks wait for an easy meal. The teeth of tiger sharks are broad at their base, pointed at the tip, serrated, and extremely sharp, a natural design that is superb for cutting and tearing their prey and for crushing the shells of sea turtles. The shells of sea turtles eliminate these reptiles as potential prey items for most sharks, but they are a favorite food source of larger tiger sharks. Unusual in the world of sharks, tiger sharks are ovoviviparous, meaning separate egg sacs are present within the mother’s uterus. The embryonic sharks absorb nutrients directly from the mother through the “shell” of each egg sac. When the eggs hatch, stronger and older siblings eat their lesser-developed brothers and sisters inside of the mother before their birth. Litter sizes range from 10 to 82 pups. The whale shark is the world’s largest fish. Individuals attain proportions of at least 50 feet (15 m) and 30,000 pounds (13,500 kg). The whale shark (Rhincodon typus) is the world’s largest fish. Individuals attain proportions of at least 50 feet (15 m) and 30,000 pounds (13,500 kg). Their enormous size makes these gentle giants easy to identify. Other prominent characteristics include ridges that run the length of the body, whitish spots on the top and sides of the body, a towering dorsal fin, large tail, and a wide, flattened mouth at the front of the face in what is known as the terminal position. The mouths of most sharks are on the underside of their snout and are said to be underslung. 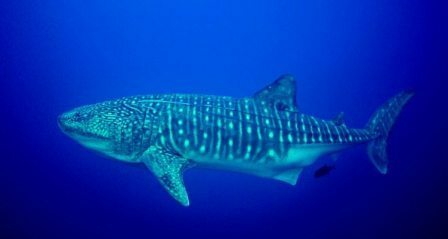 Whale sharks occur in all of the world’s tropical and subtropical oceans, and they tend to inhabit waters near coasts and offshore islands. Encounters in the Aloha state are a common, although unpredictable occurrence. Like most of the ocean’s larger creatures, whale sharks are filter feeders. They rely on dense concentrations of planktonic organisms as their primary food source although they are known to also feed on schools of small schooling fishes. When feeding, a whale shark opens its enormous mouth and moves huge quantities of plankton-filled water through its mouth and out its gill slits. Long, thin cartilaginous projections known as gill rakers, which point forward and inward from the gill arches, assist in collecting the plankton before it is moved down the digestive tract. Gray reef sharks are among the most common sharks in many Hawaiian reef communities. They are often observed in reef channels, on the reef face and in areas with strong current. Gray reefs are sometimes seen in aggregations of 20-100 sharks. 100 sharks. These groups often cooperate to ambush schools of small fish. Great hammerheads prey upon stingrays — catching them by pinning the rays to the seafloor with their wide head — as well as a variety of bony fishes, arthropods, squids and sharks. Worldwide there are eight species of hammerhead sharks. Two species, the great hammerhead (Sphyrna mokarran), the largest of all of the hammerheads, and the scalloped hammerhead (Sphyrna lewini) are occasionally seen in Hawaii. The great hammerhead is reported to reach proportions of 20 feet (6 m) and 990 pounds (446 kg). Their rectangular shaped head and tall first dorsal fin serve as good identifying characteristics. Occurring throughout the world’s tropical and subtropical sea, the great hammerhead is found both close to shore and in the open sea. Great hammerheads prey upon stingrays, catching them by pinning the rays to the seafloor with their wide head, as well as a variety of bony fishes, arthropods, squids and sharks, including great hammerheads. 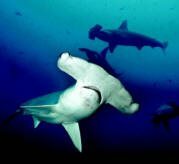 The only species of hammerhead that is known to congregate in large numbers as adults, scalloped hammerheads are thought to be the most abundant hammerhead species in tropical and semitropical seas. While not as large as the great hammerhead, the scalloped hammerhead commonly schools, meaning that as many as 30 or more animals can be seen at one time, and encounters are nothing short of awe-inspiring. The reason for the schooling behavior remains a mystery to scientists, but it is believed that a definite social order plays a part in determining where individuals are positioned in the schools. The biggest females tend to position themselves closest to the center of the schools. The preferred diet of scalloped hammerheads consists of a variety of squid and octopi as well as a number of bony fishes, including dorado, mackerel, and other sharks and rays. Young scalloped hammerheads typically feed on bottom dwelling fishes and invertebrates, while the adults tend to rely more on squids as their primary food source. It is not possible in limited space to cover every shark species that inhabits Hawaiian waters, but I should at least mention that a sandbar shark (Carcharhinus plumbeus), Galapagos shark (Carcharhinus galapagensis) or silky shark (Carcharhinus falciformis) are not uncommon sights. All of these species are impressive-looking, medium-sized, active sharks found in both near-shore and offshore waters. Two species more commonly associated with temperate waters that are sometimes seen in Hawaii are the blue shark (Prionace glauca) and the great white shark (Carcharadon carcharius). 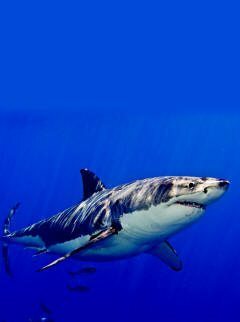 Findings from recently conducted tagging studies have revealed that some adult great white sharks that inhabit waters ranging from central California to Mexico’s Guadalupe Island sometimes make the transoceanic journey to Hawaii.